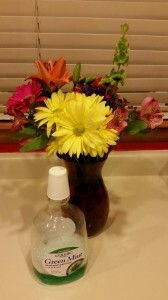 Did you know that fresh clipped and store bought bouquets of flowers LOVE mouthwash? Oh, yes they do! If your adoring husband or significant other, brings you a lovely bouquet of beautiful flowers, add just a couple teaspoons of mouthwash to the water in your vase and your flowers will keep much longer than just a few days! The pictured flowers are from four days ago and they are still looking amazing! I can usually keep my flowers looking and smelling fresh for up to two weeks or more, depending on the flowers of course (Carnations do really well and can last for nearly a month). Remember to add fresh water and mouthwash every few days (as you can see from the picture, I just use generic mouthwash – nothing too fancy – just use whatever you have a coupon for), as well as trim the stems if they are starting to get slimy. I also trim my flowers of all leaves that are submerged in the water (just helps to keep the water cleaner).